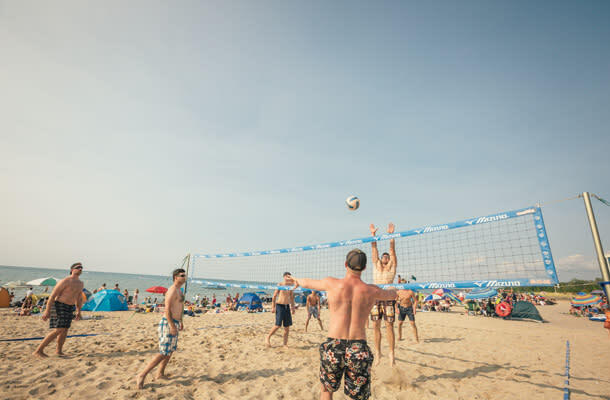 Whether your group is looking to sink into the sand and enjoy a relaxed vibe, or would rather crank it up with music, entertainment and action on the water, you’ll find it at Ontario’s best beaches. 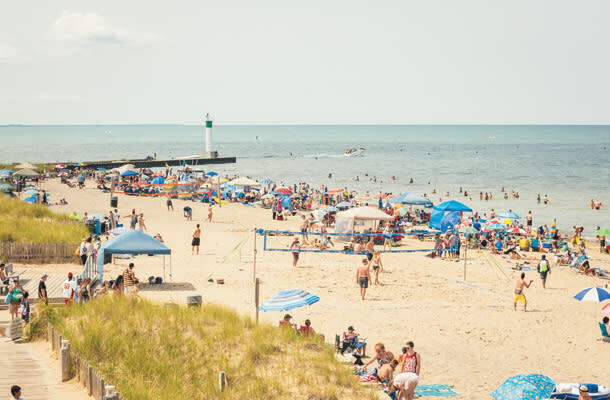 On the shores of Lake Huron, Grand Bend is a classic beach town and has been a hot-spot destination for over 100 years. It’s a legendary location for fun, and one of the few Ontario beach destinations with an active bar and nightclub scene. Don’t miss Summer Sunset Sounds, a series of free concerts on the main beach on Sunday nights (or Monday nights on long weekends) throughout the summer. Grab some friends and plan a date at a summer festival hosted in an Ontario beach town. Port Stanley CanFest has fireworks on Canada Day, a Boat Parade, and live music. Bayham Beachfest, August 3 – 5 features fabulous food, attractions, great music, and impressive fireworks. 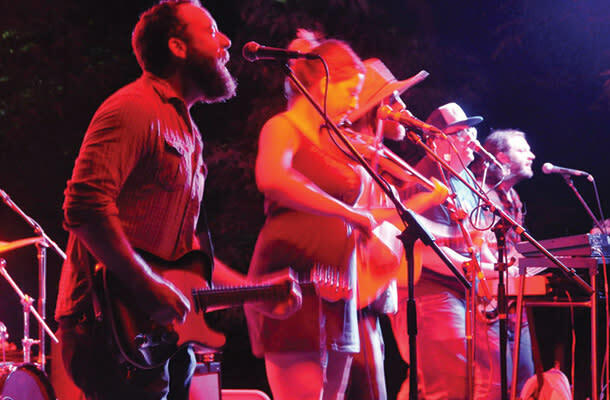 The Island Unplugged Music Festival, August 4 – 5, is the place for local and regional Canadian musicians, artisans, and local wine, beer and food creations. Consider staying over on Saturday for an awesome camping experience right on Pelee Island. Hit the courts for an afternoon of beach volleyball. You’ll find great sand courts at Grand Bend, Port Stanley, Canatara Park, and Port Burwell. Love to water ski, but don’t have access to a boat? No problem. Head to Boarder Pass at Canatara Park and give cable wakeboarding a try. After a quick lesson, the powered cable system will have you skimming over the beautiful blue waters of Sarnia Bay like a pro. Rental companies make it easy and affordable to take the hottest water toys and technologies out for a spin. 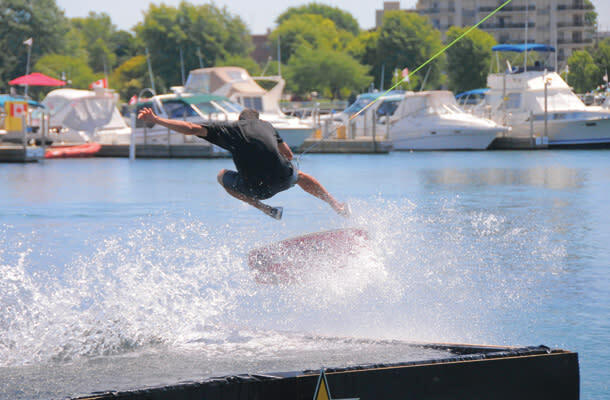 Xtreme Watersports in Grand Bend offers flyboarding experiences and a 20-foot water trampoline that will launch you into the pristine waters of Lake Huron. Deep Wave Rentals, also in Grand Bend, offers Sea-Doo and Wave-Runner rentals by the hour. Don’t forget that you’ll need a boating license. If you’re Lake Erie bound and looking for the latest water toys, make a visit to Turkey Point Watersports to rent Wave Runners, a water trampoline, Banana Boats, and paddle boards. 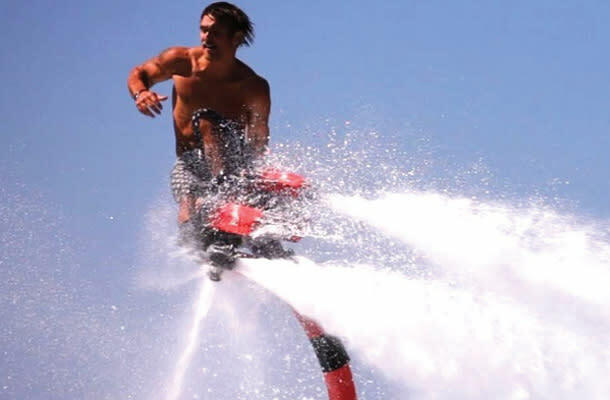 Find A Way Flyboarding, also in Turkey Point, offers a complete package for flyboard rentals that includes a life jacket, training lesson, wet suit and a professional instructor. They’ll even capture your flight in HD video for you to take home. 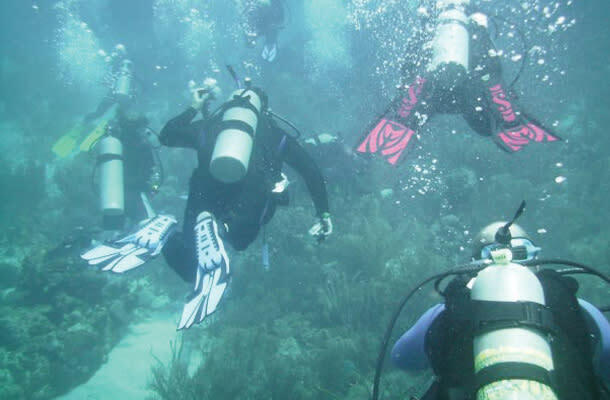 Red Devil Scuba offers scuba diving expeditions to a variety of destinations in Ontario’s Southwest, including a trip to see the Wexford shipwreck off the coast of Grand Bend and St. Clair River dives. Charter companies make it easy and fun to get out on the water for a few hours of fishing. Head to Erieau, where at least 7 different charters operate from the Erieau Marina. Read about one blogger’s charter experience here. Think you’ve got what it takes to bring home a winner? 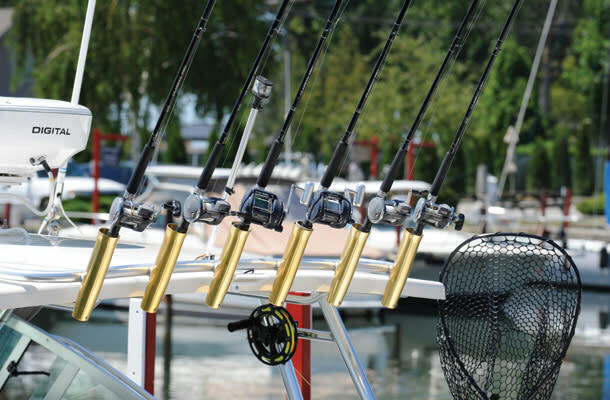 Enter one of the popular local fishing derbies that take place throughout the summer, like the Mitchell’s Bay Open on Lake St. Clair. 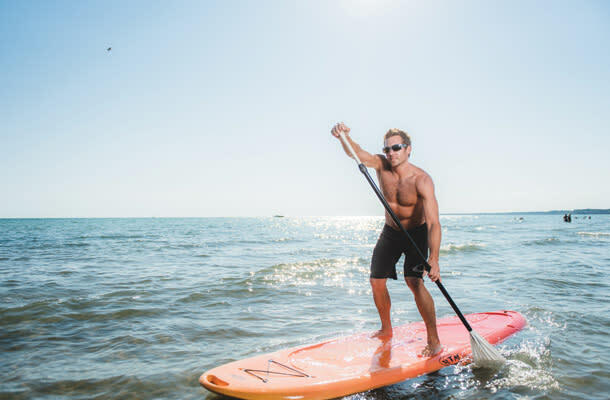 Southcoast Watersports in Port Dover is just minutes from the beach and offers stand-up paddleboard rentals, yoga classes and guided paddleboard tours in Port Dover, Turkey Point and Long Point. You can even rent boards right on the beach in Port Stanley from Sport in Port. Turkey Point isn’t just home to a great beach, it also boasts over 50 km of single track trail mountain bike trail adjacent to the Long Point World Biosphere Reserve. 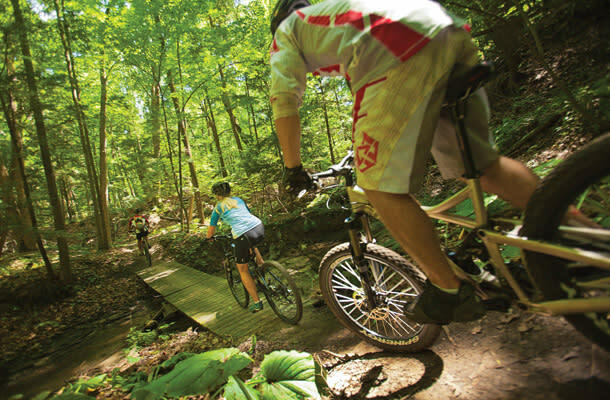 Long Point Eco-Adventures offers mountain bike rentals, and two- and six-hour guided mountain biking tours. 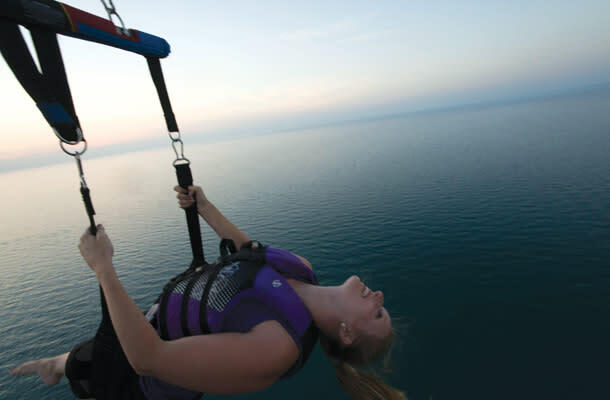 Grand Bend Parasail offers single, two-person and three-person flights that will lift you high above the shores of Lake Huron for a breezy ride with a one-of-a-kind view. 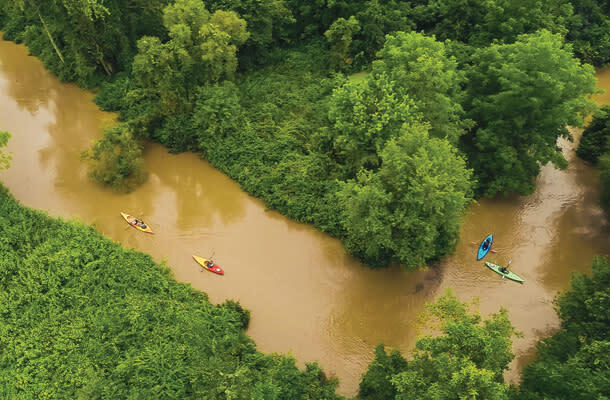 Explore Lake Erie’s Long Point by sea kayak on a guided tour that wraps up with a side tour to a nearby microbrewery. Grand Experiences’ three-hour tour runs on select dates in June, July and August, or can be booked on any date for groups of four or more. If you’re ready to take a break from the beach blanket and want to hit the waves, find out more by checking out the activities at Ontario&apos;s Best Beaches.